A fine selection of wines for any dinner party that will make you a very welcome guest. 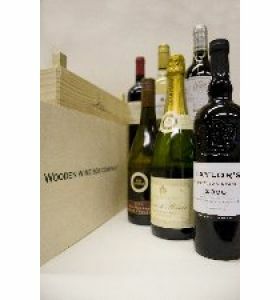 Packed neatly in a wooden box are a bottle of delicious Champagne, a crisp Sauvignon Blanc from Chile, a vibrant Pinot Grigio, a juicy Valpolicella, a smooth Rioja Reserva and a great bottle of Krohn Ambassador Port. Packed in a wooden presentation box with personal message and next working day delivery (+£6.65). Please note that during busy times we occasionally run low on stock of some wines. In this instance we may replace wines with similar favourites of equal or greater value so you can be assured of a great case.